A new part of the Chicago Riverwalk, from State Street to Clark Street, is expected to open on Saturday. CHICAGO (WLS) -- A new part of the Chicago Riverwalk, from State Street to Clark Street, opened Saturday. A rendering of the new Chicago Riverwalk. Back 140 years ago - when the river was grimy freight artery filled with boats and swing bridges - who would have imagined this. A river walk where you might sit on a teakwood bench, listen to music, sip a cup of coffee or glass of wine and contemplate life. "As people's attitudes have changed, we were fortunate enough to start these blocks, so they're very much about touching the river," said Carol Ross Barney, Ross Barney Architects. Ross Barney has been a big part of the vision behind the city's Riverwalk project, which she calls Chicago's next great civic space. Two blocks of the Riverwalk - from State to Clark - will open Saturday, though Friday there was clearly work to be done. The space from State to Dearborn is called the Marina - where motorboats can tie up. From Dearborn to Clark is called the Cove - a welcome spot for canoeists or kayakers. Mayor Rahm Emanuel did a brief walk-through Friday afternoon. 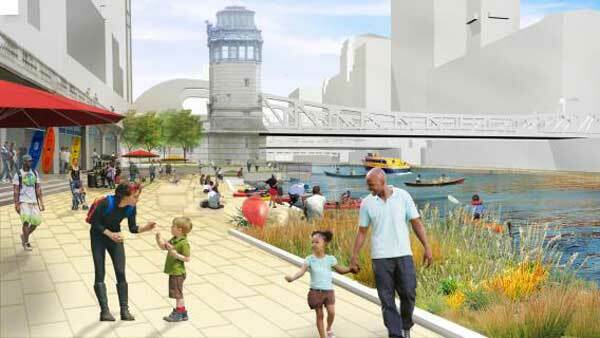 When this is all finished in 2016, the Riverwalk will run from Michigan Avenue to Lake Street. And when you walk it, under each bridge, there is a mirrored canopy above. "And now we're going to open a part of the city that's been closed for decades and generations," Emanuel said. The project is being financed by a $90 million-plus federal grant that will be paid off with revenue from vendors who will line the Riverwalk. From above, the river and its bridges have always provided a signature view of Chicago, but now, the in-person view can take you to water's edge. Maybe even to fish. In fact, 30 feet from where the mayor spoke Friday afternoon, Jeff Williams landed a creature from the deep. "He put up a little bit of a fight," Williams said. A 10-pound carp - not terribly attractive - and later returned to the deep.